Hey, Foodie Friends! 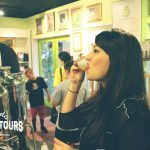 You’ve all been patiently awaiting the next Orlando Food Tours FREE ticket giveaway so we’re super excited to announce that it’s that time again – The Battle of the Biggest Foodies TICKET GIVEAWAY TIME!! Our last “Central Florida’s Biggest Foodie” winner thoroughly enjoyed wearing the title with honor but, alas, it is officially time to pass the title on to a new lucky winner! And with that honor comes <ding, ding, ding> TWO FREE TICKETS to Orlando Food Tours! So, let’s get down to business! Are You The Biggest Central Florida Foodie? Here’s all you have to do to qualify to enter the contest: 1.) Like this blog post on our Facebook page. 2.) Share this blog post (via our FB page) on your Facebook wall. 3.) Tell us (via this post’s comments section on our Facebook page) what makes you the “Biggest Central Florida Foodie.” We’re looking for the BEST reason as to why YOU’RE the biggest foodie in Central Florida. That’s it! – follow these three simple steps and you’ll be entered into our giveaway contest to win two FREE tour tickets to our Winter Park tours. The Deadline to enter (by following the three easy steps above) is Thursday May 10th! One lucky winner will be announced next Friday, May 11th! Now, let’s get this party started! Head on over to our Facebook page and tell us why you deserve to hold the title of Central Florida’s Biggest Foodie!